The creamy texture of the melted Fresh Mozzarella, the succulent taste of the warm tomatoes, and the rich tomato sauce, blend perfectly to make this pizza an instant favorite. Lightly brush pizza crust with olive oil. Spread pizza sauce evenly on crust. Decorate pizza with fresh mozzarella and tomato slices, leaving just a one half-inch rim of crust exposed around pizza. Sprinkle the fresh basil and dried oregano across the pizza. Bake pizza in oven for about 14–16 minutes or until crust is finished and pizza is hot. Let stand 3–4 minutes before cutting. Add crushed red pepper to taste. Spice it up! Add some garlic clove to spice up the dish and add some extra flavor. 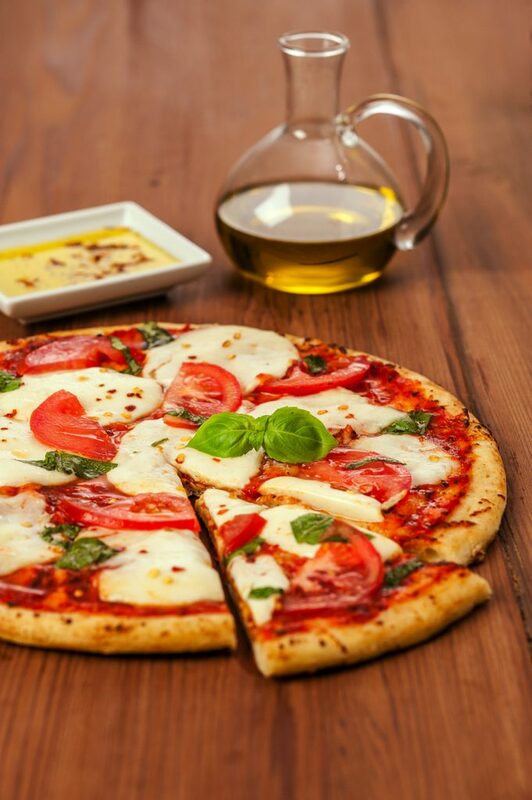 For the best Margherita pizza ensure a thin crust. The edges can be slightly thicker; however the center of the dough should allow some light through. This will ensure a crisp crunch.